Join the discussion on our forums! 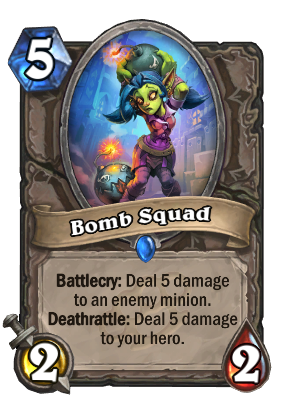 Come discuss Bomb Squad over in our dedicated Bomb Squad discussion topic. This card will be looking for a purpose in Standard life when Sylvanas Windrunner moves to Wild. What about Rogue? You can Shadowstep this card twice at least for 15 damage total (and 9 mana), which would buff Edwin VanCleef at least to 14/14 (given one has a Coin as well). Shadowstep does not stack. It will cost 5 the first time, 3 the second time, and 3 the third time. So to pull off your combo with Eddie, you would need at least 4 coins. Best play sound in this set.